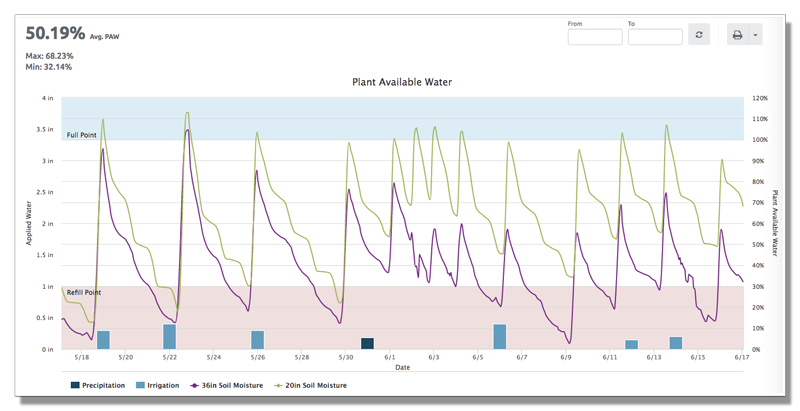 How Can Plant Available Water Models Help Your Irrigation? Many of you, our customers, are already bringing in soil moisture data through your existing ready partner to optimize your irrigation methods. We want you to get the most out of your soil moisture data and have an entire toolset to maximize the usability of the data you’re already bringing in. We’d like to introduce you to our Plant Available Water Model, commonly referred to as PAW. We’ll go through exactly what this is, how it benefits you, and what the process is to set-up a PAW model through OnFarm. Whether you’re familiar with PAW or may have heard this model referred to as Available Water Capacity (AWC), they’re both the same. OnFarm specifically uses the term PAW, which is a model that transforms soil moisture values into a percentage which represents the amount of water available to the plant. PAW does this by setting the field capacity (FC) of your soil as 100% water available to the plant and your permanent wilting point (PWP) as 0% water available. 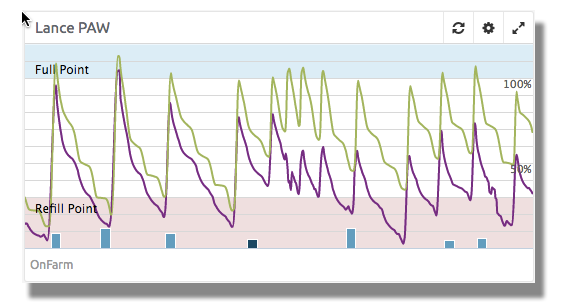 If you’re like many farmers, you’re probably already driving your irrigation by trying to keep your soil moisture levels somewhere between FC and PWP. However, each soil type and soil layer can have different FC’s and PWP’s making it difficult to clearly see how much water is available to your plants. PAW takes a lot of the tedious work out of this process. After a one-time set-up for each soil layer, you can view all your soil moisture in a PAW chart. You no longer need to remember every soil layer’s FC and PWP as well as what soil moisture value you want to start irrigating at (usually half-way between FC and PWP) for every field on your farm. With PAW, you simply set-up the models one time, maybe with some minor ongoing maintenance, and we normalize this data. You no longer need to look at a chart showing percent volumetric water content (%VWC) in a soil layer where the FC is 28%VWC and the PWP is 14%VWC and calculating the point you want to start irrigating, say 21%VWC (halfway between FC and PWP). With PAW, you see what you really care about, how much water is available to your plant and when you want to start irrigating (usually 50% PAW). You’ll have a quick and easy visualization to know exactly how you’re doing and potential adjustments. Some really nice additional features of the PAW charts include the ability to see each individual soil moisture layer in the set as a separate graph (using customizable colors) along with the ability to overlap precipitation and irrigation charts. This gives you a complete overview of your irrigation, precipitation, and soil moisture all in one place. It’s a great way to visualize your soil infiltration and to coordinate with other scheduled events such as fertilization. The set-up is completely available through the app. We invite you to check-out the PAW model. It is currently only available to our paid customers. If you’re on a free account and would like additional information on PAW, or would like to sign-up for a PAW webinar to see it in action, please let us know by filling out the form below. If you are already a paid customer and need assistance in getting started or have any questions, please contact us at support@onfarm.com. Sign up with OnFarm today; simple to start, no long term commitments.